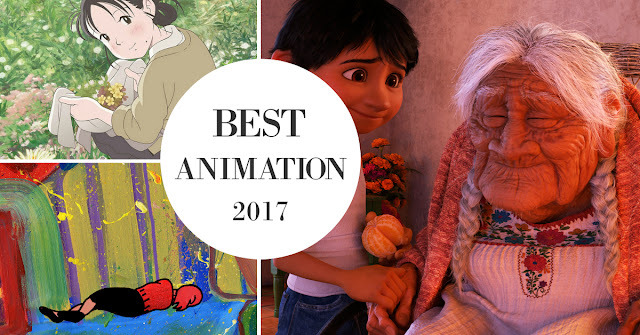 2017 was pretty weak year for animation over all, but that doesn't mean there weren't a few bright spots out there, especially if you stepped away from the mainstream multiplex (big studio animation was in especially bad shape this year). GKIDS was far and away the winner this year, making up half my list and almost adding a sixth with an honorable mention for Birdboy: The Forgotten Children. Here are the ten that I found most memorable. Anyone who has ever seen a Pixar movie will likely see the twist coming a mile away, but Coco puts a fresh new spin on the studio's now familiar formula. It's a classic tale about pursuing your dreams and the importance of family, but rarely have we seen such stories told with such artful conviction. Coco is a wonder, a dazzling and deeply moving candy-colored fantasia fueled by the power of music. And what glorious music it is; Michael Giacchino's score, accompanied by memorable songs ("Remember Me" is a haunting stunner) has the power to make the toes tap and the heart soar. By the time it reaches its quietly powerful denouement, even the most jaded of viewers will likely find themselves wiping away a tear. Such is the power and beauty of Pixar's craft, and their innate ability to understand the inner workings of the human heart. It's yet another crowning achievement from one of the finest names in animation, a soulful and timeless creation that strikes a universal chord. When all else fades away, family is all we have. Cherish them, and cherish Coco. Mainstream cinema is rarely this good, or this electrifying. In This Corner of the World is a beautifully realized family drama set against the backdrop of war. It is a sobering and at times wrenching look at Japanese life during the war, which is a perspective from which American audiences have been particularly far removed. Free of jingoism and nationalistic posturing, Katabuchi examines the human toll of war on those left at home, where politics matter little and the day to day drudgery of existence is foremost on the people's minds. I couldn't help but be reminded of the works of Isao Takahata, especially Grave of the Fireflies, with its graceful humanity coupled with an unflinching depiction of the horrors of war. While perhaps not as harrowing as Takahata's 1988 classic, In This Corner of the World is nevertheless a deeply humane and tender work, a bit overlong perhaps but undeniably moving. It's matter-of-fact treatment of wartime tragedy is at once haunting and heartbreaking. Wars aren't just fought by soldiers, and here the sacrifices of the average citizen is the stuff of intimate and unforgettable drama. In all my years of reviewing films, I don't think I've ever seen a film quite like Dash Shaw's extraordinary debut feature, My Entire High School Sinking into the Sea. A dazzling, almost psychedelic animated phantasmagoria, Shaw's film takes a deep dive into the wild and crazy time that is high school, turning a natural disaster into a disarmingly astute metaphor for the chaos of the teenage years. Shaw's style, combining crude hand-drawn figures, and abstract colors and imagery, recalls the work of early animators like Émile Cohl (whose 1908 short, Fantasmagorie, was the first film to consist entirely of animation) by way of more contemporary surrealists like Stan Brakhage and Hollis Frampton. There are perhaps few more surreal periods in a person's life than the teenage years, and My Entire High School Sinking into the Sea captures all the turmoil, discord, and strange beauty of growing up with a wise and clever eye. It's a funny, sad, strange, and altogether wonderful film that will speak to anyone who ever felt lost on the stormy and at times disorienting seas of adolescence, where seemingly petty squabbles feel like the end of the world and status is the defining facet of identity. Based on a fairy tale by the Brothers Grimm, Sébastien Laudenbach's animated wonder, The Girl Without Hands, is a breathtaking morality play featuring some of the most beautifully unique animation ever put on screen.What stands out here is the gorgeous, impressionistic animation, that seems to fade in and out of the frame, popping with striking colors and coalescing and de-forming based on the character's emotional state. It's like a pencil and watercolor dream made of half-formed images and fragments of memories. In a year that has been so weak for animation, The Girl Without Hands stands out as a creative high point, an original and heartfelt fairy tale whose unique style perfectly serves its well worn story, making it feel vibrant and new. It's a film where style meets substance, where each frame is a work of art all its own, a shattering and ultimately hopeful tale of a greed and love that feels like something carved from our deepest subconscious. It's a remarkable achievement. Also known as Ancien and the Magic Tablet, Kenji Kamiyama's Napping Princess is a unique and often ingenious animated reverie that cleverly blurs the lines between fantasy and reality. It's a thrilling ride, beautifully animated and often brilliantly conceived. These flashes of creative ingenuity are what keep it moving, providing an emotional anchor even when the narrative gets lost. Its blending of dreams and real life is, for the most part, sharply realized, and provides a grand canvas for dealing with real life issues (including a not-so-subtle critique of capitalistic greed), not to mention its knack for mixing real technology with fantastical sci-fi elements that crossover between worlds. There's a lot to unpack here, and even if it doesn't always hit every note perfectly, it's still a compelling and emotionally astute adventure with a heart of gold. Another animated winner from GKIDS and Cartoon Saloon, the Irish animation house that produced surprise Oscar nominees The Secret of Kells and Song of the Sea, Nora Twomey's The Breadwinner move away from Irish legends for a tale set in Taliban-controlled Afghanistan. Based on the novel by Deborah Ellis, The Breadwinner paints a wrenching portrait of the struggles of women just to be acknowledged as human beings. Twomey tells a story of universal humanity that bursts through the screen in vibrant swirls of color. It may tend to become unfocused in the middle stretch, but the ultimate emotional impact remains undimmed. Tom McGrath (Madagascar) takes an outlandish premise about a baby (voiced by Alec Baldwin) who comes from a heavenly baby company to earth in order to save his company from being replaced by puppies, and turns it into a surprisingly moving film about family and the unique bond between siblings. Most notably, The Boss Baby captures the spirit of childhood play and imagination in disarmingly indelible ways, as their fantasies blend into the real world around them, constantly informing how they interact with each other. It's a bit silly at times, but it's almost better than it has any right to be, with Baldwin giving an amusing performance as the titular baby. This is one that sneaks up on you. It is fitting that Hiromasa Yonebayashi, who helmed Studio Ghibli's final film, When Marnie Was There, should also direct the inaugural feature of Studio Ponoc, the Japanese animation house that rose out of Ghibli's ashes. Mary and the Witch's Flower is an adaptation of Mary Stewart's "The Little Broomstick," about a young girl who discovers a magical flower in the forest that transports her into a world of witches and magic. The film plays like a kind of "Ghibli's greatest hits," borrowing elements from Spirited Away, Kiki's Delivery Service, Castle in the Sky, and even Princess Mononoke, resulting in a film that never really establishes a personality of its own. On the one hand, it displays a disappointing lack of creativity for Studio Ponoc's debut feature. On the other hand, it shows they're playing it safe the first time out of the gate, sticking to tried and true story elements that have already been proven to work. It's an engaging adventure that hinges on the importance of embracing one's differences, and how the things we believe set us apart are often our greatest strengths. It may not quite have the same energetic verve of The LEGO Movie, but The LEGO Batman Movie still has a slyly satirical sense of humor that really makes these movies sing. As written by Seth Grahame-Smith (Abraham Lincoln: Vampire Hunter), The LEGO Batman Movie is a gleefully silly spoof of 50 years worth of Batman, from the very first Batman movie starring Adam West, all the way to Batman vs. Superman. It even takes the time to poke fun at DC's ill-fated Suicide Squad. It's a nearly pitch-perfect blend of superhero satire and comic adventure, capturing the spirit of Batman in all his inherent absurdity, in the process becoming the best Batman movie since Nolan's Dark Knight trilogy. It's unlikely that we will see a film this year as breathtakingly beautiful as Dorota Kobiela and Hugh Welchman's Loving Vincent, the first fully oil-painted film ever made. Each frame is like a living work of art, hand-painted by a team of over 120 artists over the period of seven years. Visually, it's a masterpiece, a stunning evocation of the life and work of the legendary artist, Vincent Van Gogh. It feels as if we are stepping into one of Van Gogh's paintings, and the results are nothing short of stunning.